Passing the written exam has never been easier. It's like having the answers before you take the test. This guide will answer many of the frequently asked questions concerning driver's education programs around the country. If you need state-specific information about regulations and requirements, please refer to your state's Driver's Ed guide. Do I have to take Driver's Ed to get a driver's license or permit? The answer to this question rests entirely upon your state of residence. Depending on your state, driver's education may be a requirement to receive a learner's permit or license. Most states do require some sort of education program prior to receiving a license or permit. Similarly, Driver's Ed may be necessary for teens transferring a permit from one state to another, or for adults who have never yet been licensed to drive. Check your state's Driver's Ed requirements for details. Are there age requirements for driver's education? In California, you must be between 15 1/2 and 17 1/2 years old. In Michigan, you may be at least 14 years and 8 months old and must have permission from a legal guardian. 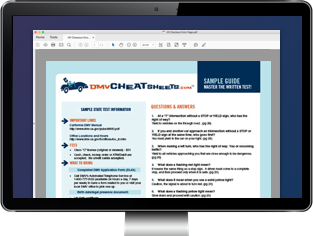 You can find the requirements for your particular state on our Driver's Ed guides. Again, this is completely state-dependent. Most states will have a minimum requirement of “classroom hours," or the hours you spend doing theoretical learning, as well as a minimum requirement of “behind-the-wheel hours," or the time you spend doing practical training on the road. In California, for example, you must complete 25 hours of classroom instruction plus 6 hours of behind-the-wheel driver training. Is there a difference between Driver's Ed and driver's training? Yes, technically, though many people (and some states) use the terms interchangeably. Driver's education is a classroom course that will help you to pass your written examination for your learner's permit. It consists of “textbook" lessons, and can sometimes be coupled with a driver's training course per your state's requirements. Driver's training, which is also required in some states, is actual in-car lessons given by a licensed driving instructor. This requirement must usually be completed once you have a learner's permit but prior to your road driver's test, though sometimes it is rolled into your Driver's Ed course once your classroom lessons have been completed. Make sure you're aware of the terms your state uses to describe its driver's education program and what they mean for you. Some states require separate driver's training programs outside of your Driver's Ed class, while other states combine the two and simply call it “Driver's Ed." Why is Driver's Ed important? Other than being a requirement to obtain your permit and eventually your license, driver's education courses will teach you the essentials about vehicle safety and other rules of the road that will prepare you for the written test and road driving tests. Many courses today also include defensive driving techniques that help you avoid hazards on the roads, and sharpen your reaction skills if you do end up in a precarious situation. What will I learn in my course? Your state's traffic laws and road rules. Sharing the road with other vehicles, pedestrians, and cyclists. Proper handling of a vehicle in adverse weather conditions. How much will driver's education cost me? Fees vary based on the type of course you take, and the state you take it in. Private driver education companies, including online Driver's Ed courses, typically have their own pricing structures. Sometimes you can take Driver's Ed through your public high school, and these costs will be at the discretion of your school system—some schools offer them for free if Driver's Ed is a requirement of your school curriculum. Can I take driver education online? Yes, though many are run by private companies not associated with your state's DMV. It's important to ensure that the course you're interested in is approved by your state department of motor vehicles or similar licensing agency. For more information about Driver's Ed, find your state-specific guide. Most states will require an end-of-course examination before you can receive your certificate of completion. Rules for your exam vary by state, but often you are able to retake it more than once in the event that you don't pass on your first try. What should I do to prepare for my Driver's Ed course? As long as you meet the requirements of your state and complete the proper forms for enrollment, there is very little you need to do prior to attending classes. To familiarize yourself with the material, it's always a good idea to read your state's driver's manual, which will be used for the examination at the end of the course. In addition to studying the driver's handbook, you may benefit greatly by taking a practice test—especially since these are based on the written tests you'll need to take to earn your permit! You'll be one step ahead in your journey to the open road behind the wheel.